My previous experience with Quebecois black metal was Forteresse album Par Hauts Bois et Vastes Plaines and an album by Neige et Noirceur the review for which you can find by using the Search button. Somebody Fiel, who is Forteresse drummer, has added to the scene in the form of his own project Grimoire, the EP L’aorasie des spectres reveurs coming out a few years after a debut full-length. Staying within the confines of the genre, whether you call it Cascadian, Quebecois or simply atmospheric/ambient black metal, L’aorasie des spectres reveurs is a very pleasant and confident slightly less than half hour immersion. Set to alternating double bass or blast drumming, the former can actually be almost incessant and overpowering at times, Grimoire paints the picture of exalted celebrations dedicated to some celestial deity, set amidst vast frozen landscapes. I am trying to be pictorial of course, but you get the image of drawn out textured guitar riffs weaving rich and dense tapestry, synth melody touches which could be quite uplifting (Tragedie des ombres) and vocals hissing about, adding another layer to the shroud. The careful synth melodies and minimalistic piano touches in the margins (Les rumeurs des astres) actually create for interesting moments providing accents. Several melodies on L’aorasie des spectres reveurs are simply majestic. After elfish horn sounds around 3’ in Les rumeurs des astres, the whole animal kingdom stirs up and crashes around 4.5’, only to rise up again in its starbound majestic beauty. Cachot de cristal begins where Les rumeurs des astres ends, but dies after such quick start. The build up to follow, from epic slow moving wall of guitars to the apogee around 4.5’ is fantastic, the grandiose melody seizing the moment. The EP closes with a children’s chorus, stargazing, leaning on piano and metal triangle percussion, an unwinding moment after a journey in some far away frozen space. L’aorasie des spectres reveurs may be short, but in this case it actually helps not to draw the music out endlessly, as all songs on the EP then become worth revisiting. Doing ten of these 7 min long marathons in a row would have been boring and unnecessary. 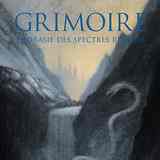 Fans of early Wolves in the Throne Room, Alcest, Heretoir or Lustre should definitely consider listening to Grimoire, and if you are into the Quebecois scene then perhaps I am even late alerting you to this project.